For ten years the Regional Centres of Expertise on Education for Sustainable Development (RCE’s) have been active in supporting the UN Decade of Education for Sustainable Development. 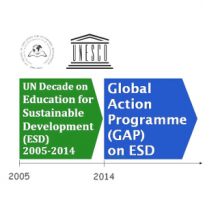 Now the decade is ended and we are now working on the Global Action Programme (GAP) on ESD. As there will be a substantial number of RCE´s present at WEEC2015 we will take the opportunity to enable an enhanced discussion on how the RCE networks can support the GAP, and how GAP can support the progress of the RCE networks. What are the roles of the RCEs in implementing GAP, what are the strategic actions to take. RCE West Sweden will be the main organizer of this event which means we will use the Open Space method for the discussions. This is the method that we have used throughout our measures. This requires active participation from all of us. We will start off by setting the agenda together in relation to the theme. We look forward to an engaging evening together. As time will be limited we will unfortunately not have time to conduct any lengthier presentations of what we are up to in our different parts of the world . We therefore suggest You might introduce Your RCE shortly in advance below here. Introduction to the Open Space method and production of a joint agenda/ Open space layout that we will act on the remaining time. NOTE that the event will take place at the parallel session rooms at Humanisten at the WEEC2015 venue Not at GMV as said earlier. Organizer: The Nordic RCE’s through RCE West Sweden.